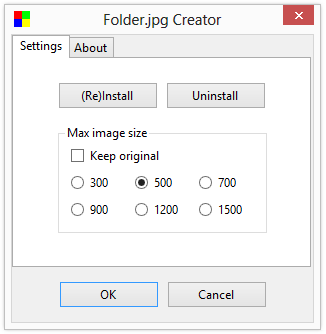 Folder.jpg Creator creates folder.jpg file for Windows Media Player from BMP, JPEG, PNG or TIFF image file. This program does not require installation, just download archive, unzip it into any folder and run the executable file as administrator. In opened window click the "(Re)Install" button to add new menu item in Explorer's context menu. In this window you can also preffered size of album cover size. Click the "OK" button to save the setting. Later you can call this program to change settings. Reinstallation is also required after changing location of the program executable file. 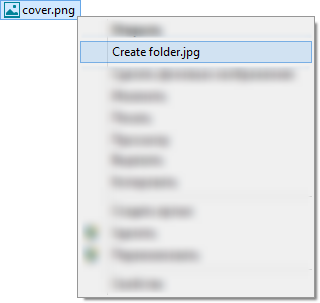 After program installation just click right mouse button on any image file in Explorer, choose "Create folder.jpg" item from Explorer's context menu and new "folder.jpg" file will be created from the chosen file. To delete program from your computer run program's executable file, click the "Uninstall" button and then delete the executable file.